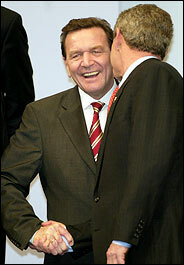 President Bush and Chancellor Gerhard Schröder of Germany on Thursday in Prague. Relations between the two had been strained. PRAGUE, Nov. 21 — At a summit meeting scripted to embrace seven new members from the old Soviet bloc, the 19 leaders of the North Atlantic alliance united today behind President Bush and strongly condemned Iraq, saying it had failed to meet United Nations demands to surrender weapons of mass destruction. Yet Germany's continued opposition to taking part in any war with Iraq seemed all but certain to prevent the alliance from formally entering a campaign, though many of its members appeared willing to do so on an ad hoc basis. Gathered in this graceful capital of Baroque and Gothic lines, the NATO leaders also agreed to an American proposal to establish a rapid reaction force over the next four years intended to move swiftly around the globe and keep NATO relevant in the fight against terrorism. Late today, when Western leaders arrayed themselves around a huge circular table for their final session of the day, the Latvian president, Vaira Vike-Freiberga, thanked them for admitting a raft of militarily weak nations that crave the security and economic stability already being enjoyed in Poland, Hungary and the Czech Republic. They joined the alliance in 1999. "Latvia lost its independence for a very long time," she said, "and knows the meaning of independence and the loss of it; knows the meaning of security, and the loss of it." For Ms. Freiberga today was "a momentous moment writ large." As a child in 1944, she fled Soviet forces and her homeland by small boat. She grew up in refugee camps in Germany and French Morocco before settling in Canada, where she was a noted psychologist. "Hope," she said, is what today's enlargement gives to the remaining small states in the Balkans and elsewhere that aspire to "the rock of political certainty" that membership conveys, along with encouragement for countries "trying to recover from a half century of totalitarian rule." But stirring rhetoric about expanding NATO to the borders of its cold war enemy did little to disguise the very real cracks in alliance unity on Iraq. Germany remains implacably opposed to taking part in a war, and the NATO leaders notably did not commit NATO forces to a military campaign against Iraq in the event Saddam Hussein does not comply with the United Nations' demands to disarm. European diplomats and Bush administration officials did report a growing consensus that an ad hoc alliance comprising some NATO countries — along with some Arab states — would be willing to take part in an eventual military campaign against Iraq. A senior administration official traveling with Mr. Bush said tonight that diplomatic contacts with dozens of nations that might be called upon to provide support or assistance in a military attack on Iraq were part of a strategy of prudent war planning to keep the pressure on Baghdad. It has until Dec. 8 to detail programs concerning weapons of mass destruction that senior Iraqi officials say they do not have. Condoleezza Rice, Mr. Bush s national security adviser, said she remained "skeptical" that Mr. Hussein would comply. "We haven't seen anything yet which suggests that this is a leopard that is changing its spots," she said, adding a warning, "If Iraq tries to shift the burden of proof on to the inspectors, that would be a great mistake, because the burden of proof is on Saddam Hussein." The many political fissures within a slowly uniting Europe were evident in a new diplomatic divide today when the seven nations that were formally invited into NATO joined with three aspiring NATO countries in issuing their own muscular declaration on Iraq. As a bloc of NATO newcomers, the East European and Baltic states that lived under Soviet rule have exuded a more militant and openly pro-American spirit. Mr. Bush has taken to citing this new spirit on NATO's eastern flank to exhort NATO's older members to action. "The Baltic countries know what it means to live under fear and the lack of freedom and to have these countries be allied to the United States and other nations is important to our soul," Mr. Bush said in an interview with Lithuanian television today. The newly accepted member states are Bulgaria, Estonia, Latvia, Lithuania, Romania, Slovakia and Slovenia, which have a combined population of 46 million. Their membership in the alliance will be complete in 2004. Albania, Croatia and Macedonia joined them in the Iraq statement. They said in their communiqué that if Iraq failed to comply with the recent United Nations Security Council resolution on Iraq, "we are prepared to contribute to an international coalition to enforce its provisions and the disarmament of Iraq." But the German-American rift was the deeper and preoccupying concern of this meeting, and not just because the German position on Iraq virtually ensures that the NATO alliance as an institution will sit out any Iraq campaign as it sat out the American-led attack on Qaeda and Taliban forces in Afghanistan. Germany is the powerful center of NATO on the Continent, and its pacifist stirrings could undermine alliance cohesion and America's push for a more aggressive, even pre-emptive, NATO posture against new terrorist threats. President Bush and German Chancellor Gerhard Schröder shook hands and exchanged pleasantries at a banquet Wednesday evening, but the chill between Berlin and Washington was still evident when Foreign Minister Joschka Fischer emerged from the summit meeting hall today to tell reporters that despite the strong NATO stand, "We are against military action," adding: "We don't support military action. We want the possibility not to become the reality." Still, Germany supported today's NATO statement on Iraq, and one senior American official pronounced himself "gratified" that it had done so "without dragging its claws or being pushed." A German official said Mr. Schröder would not apologize for taking a position that had broad political support at home. "America has always said that they want self-confident leaders in Germany and now they have them," said the official, Karsten D. Voigt, coordinator for German-American affairs in the Foreign Ministry. For Mr. Schröder, he added, it was a matter of "self-esteem" to await the right moment for reconciliation. Late today, during a photo session, Mr. Bush and Mr. Schröder again shook hands and exchanged a few words, and some Germans saw a signal that a thaw might have begun. France today, too, differed openly with the United States even as it endorsed unrelenting pressure on Iraq. French diplomats issued their own version of the NATO declaration, in French, with a critical change on what might touch off a war. "It is true that both texts are operative," said a chagrined American official, because in NATO, English and French are the official languages. France asserted that Iraq faced "serious consequences if it continues" violating its obligations, while the English-language version drafted by the American delegation said Iraq would face serious consequences "as a result of its continued violations of its obligations." The French interpretation was a pointed signal that President Jacques Chirac's government still is seeking to remove any "automatic" catalyst for war. France favors giving Iraq a clear and final opportunity to bring itself into compliance. "There is no alternative for Iraq to full and entire cooperation with the United Nations," Mr. Chirac told Western leaders, according to his spokeswoman, Catherine Colonna. "Iraq must understand that it must seize the chance that is offered, and understand that this is the last chance," he reportedly added. Madeleine K. Albright, secretary of state during the Clinton administration, was one of many dignitaries who traveled here to celebrate the first NATO summit meeting to be held in a former Warsaw Pact capital. Ms. Albright was born in Czechoslovakia and speaks Czech. She admitted to a grudging admiration for what she termed Mr. Bush's transformation since his speech to the United Nations on Sept. 12. "I think it is the right direction," she said. "We have been seeing a different George Bush after the U.N. speech and I sense that he has gotten some reality check that has taught him that even if you want to go it alone, you can't." Mr. Bush said today that he looked forward to flying from this summit meeting to Russia, where he will meet President Vladimir V. Putin in the old northern capital of St. Petersburg. Diplomats described his visit as a necessary gesture to Mr. Putin for his forbearance in the face of NATO expansion and for his strategic alignment with Washington since the Sept. 11 attacks, but also in recognition of the influence Russia wields when allied with France and China, as it was during the United Nations debate on Iraq. "I'm going to say to the Russian people, you shouldn't fear expansion of NATO to your border because these are peace-loving people and you ought to welcome them," Mr. Bush said. He also reassured Moscow that its economic interests in Iraq would be honored if the United States led an invasion force against Mr. Hussein. "We have no desire to run the show, to run the country," Mr. Bush said of Iraq in remarks to Russia's NTV network. "We will work to encourage the development of new leadership and protect the country's territorial integrity." "And we understand Russia has got interests there, as do other countries, and of course, those interests will be honored."